THERE is no greater or 1 more solemn commission given to the ministry than that of bringing, under the leadership of the Holy Spirit, the promised and greatly needed revival of spiritual life and power to our people. The servant of God has told us that this is “the greatest and most urgent of all our needs. To seek this should be our first work.”—Selected Messages, vol. I, p. 121. Without it the work cannot be finished. Without it the church would be unprepared for translation. With it God will cut short His work in righteousness. O that we would delay no longer in bringing to our trusting people this deep and more truly spiritual ministry! Our people are hungry. They rightly look to us for such leadership. They are disappointed when we fail to give it. The dangers of worldly compromise, the needs of our youth in this hour of peril, solemnly challenge the ministry. We do not need to reproduce here the many unequivocal statements of the Bible on what God intends to do for His people when the way is prepared. The promised “outpouring of the Holy Spirit,” “the latter rain,” “the loud cry,” are expressions familiar to all of us. Ever since I was a child I have heard our ministers preach and pray concerning it. I have longed that I might be privileged to share in that last glorious display of God’s power on this earth, when we are told that the scenes of Pentecost will be eclipsed. But as yet the promise of its fullness has not been fulfilled. We have been told that “when the way is prepared for the Spirit of God, the blessing will come.”—Ibid., p. 124. Here is the key to the blessing of heaven. Here is the secret of power. Here is the explanation for our failures of the past and of the present. The entire story of the Bible is a history of revival. Read the story of that mighty revival recorded in 2 Chronicles 15. The people sinned. They became like the people around them and served other gods. God raised up His messenger and through him spoke messages of love and power. What happened? They were convicted. They put away their idols. They raised an altar to the Lord and had some great meetings. The people came from all around, even from other countries, when they saw that the Lord was with them. Make no mistake, the hunger of the soul for God is universal. When the glory of the Lord is manifested and the fire is on the altar, when sin is put away and Christ the Saviour is made Lord, the crowds will come and mighty revivals will take place. When God finds truly humble and dedi- cated instruments who are willing to pay the price that a truly spiritual ministry demands, He has mighty weapons in His hand for the breaking down of strongholds and the establishing of His kingdom in the hearts of men. The greatest preparation for any revival must take place in the hearts of the instruments God will use. It is the preacher’s inner life that matters most, and argely determines the success or failure of any revival. It is not his education, his cul- ture, or his organizing ability, important as they may be. If he is a born-again servant of God, and has a passionate love for Christ; if he has a tender and understanding heart in his dealing with souls, and a growing love for and familiarity with the Word of God; if he is an unworldly man whom the people know comes to his task from the higher levels of fellowship and communion with God, a vitalizing power will attend his ministry. If he does not have this his ministry becomes mediocre and ineffective. Successful ministry is costly. It is a spiritual work. Find a man who will diligently cultivate his own soul and you will have an instrument of power. Otherwise, we merely preach but we do not woo. We talk, but nothing happens. We pass multitudes of resolutions, but nobody quakes. There is no vital movement toward God. The simple fact is this: when for any reason we become separated from the God we vowed to serve, we cease to become effective channels of His grace to His people. Then let the fire fall. Let the cleansing, energizing power of the Holy Spirit take possession of us. Let Jesus Christ and His will become the passion of our lives. Let self-glory vanish and the blessing will come, and the fires of true revival will be kindled in every land. During the last four years it has been my privilege to minister to thousands of our youth and our people in revival efforts in twelve cities, and in our colleges and academies in North America as well as in other lands. We give praise to our heavenly Father for what we have seen, especially among our youth. Surely one of the most heartening things that we see in all God’s work today is the response in the hearts of our young people to the call of God. As these were youth-centered revivals, we have worked through the union and local Missionary Volunteer secretaries in preparing for and organizing the meetings. They in turn worked closely with the conference president and local pastor. It is impossible to overestimate the importance of the local pastor’s influence in the promoting of the revival. His vision, support, and participation are essential to its success and to the follow-up. We have followed the plan of holding meetings for nine-night periods, from Friday night until the Saturday night a week later, in a center where a number of churches could combine. The organization of Friendship Teams among our young people and members at least six weeks before our meetings were to begin, has been a special feature and especially “blessed by the Lord. Prior to our crusade in Los Angles, Desmond Cummings, the MV secretary of the Southern California Conference, followed a plan of Friendship Team participation that produced remarkable results. In the city of Chicago, three weeks before the meetings began, more than 1,100 former Seventh-day Adventists and discouraged church members were being visited by members of the Friendship Teams. In the more recent Orlando, Florida, effort there were 60 Friendship Teams contacting more than 200 former members. Many times our hearts have been blessed and stirred by the sight of scores of our consecrated teen-agers and young people bringing their needy friends to the meetings and coming forward with them when the call was made. We have had the joy of seeing hundreds of back-sliders reclaimed, sin put away, and families reunited in a new and tender relationship of love to each other and to their Lord. The Sabbath prior to the recent Orlando, Florida, effort, was a day of fasting and prayer. The churches held all-day services of intercession for the meetings. Hundreds, both old and voung, devoted the day to prayer and heart-searching. We are told that “a revival need be expected only in an- swer to prayer/’—Ibid., p. 121. There is no substitute for prayer. Real praying involves an outlay of time and effort that flesh and blood does not like. It is a spiritual work. Let the ministers lead the people into an experience of deep heart-searching and prevailing prayer, and results must come. “Only the work accomplished with much prayer, and sanctified by the merit of Christ, will in the end prove to have been efficient for good.”—The Desire of Ages, p. 362. I am sure that no one in Orlando who attended those prayer seasons fully realized what was going to happen. The way indeed was prepared and the blessing came. Increasing and unprecedented crowds of up to 1,500 packed the Orlando central church each night. The meetings were extended by urgent request. The presence of God was felt in a powerful way, especially in the hearts of our youth who came from Forest Lake Academy and the surrounding churches. The last Saturday night witnessed a Pentecostal season in a meeting that lasted nearly four hours. It was impossible to close it. Great and marvelous victories were won in the hearts of our youth, many of whom were in very great need. Strong men wept as they saw and felt the power of God working upon the hearts of our youth. Surely this is not the work of man. Who among us has power to convict of sin and to turn sinners to righteousness? It is God’s doing and it is marvelous in our eyes. Let us be careful lest we take the glory that be- longs to Him, or treat lightly the work of the Holy Spirit upon human hearts. Someone might say that we have to be careful about emotionalism. That is true, but there is a vast difference between emotionalism and godly emotion. We cannot have too little of the former and too much of the latter. A godly sorrow for sin touches the emotions. Our Saviour wept for sinners and His heart bled and was broken for a lost world. Brethren, our hearts also must bleed if we would be ministers of the saving power of Christ’s blood. Tearless hearts can never be heralds of the passion of Him who “offered up prayers and supplications with strong crying and tears” (Heb. 5:7). We follow the plan in most of the meet- ings of either making an altar call or of holding an after-meeting. Altar calls are made when the Spirit of conviction is markedly present. Sometimes an invitation is given for those who feel their need and who wish to stay for an after-season of prayer to come to the prayer room during the singing of the last hymn. It is in these after-services where much of the real work of the campaign is done. Here we come into a closer, more intimate contact with those who are needing help. The pastors meet with us. Decision cards are used for follow-up work. If any wish personal help the pastors take them aside right there in the church or in some anteroom for counseling and prayer. What blessed seasons, what reaching out to the Lord, what victories claimed by faith have been experienced in these after-services. During the week the pastors and local workers meet each morning for an hour of prayer, heart-searching, and Bible study. The rest of the day is given to visitation in the homes of those especially in need of help and to those in the academy and church school. The final Saturday night is devoted to praise and testimony. These meetings have been among the most powerful and blessed of all. A distinct blessing comes to those who have found a new experience in Christ when they give expression to their faith and love in testimonies of praise. Frequently many more decisions have been secured as we have used the earnest testimony of some youth who has found Christ anew as a basis of appeals to others in the audience. We need to use the personal testimony method more than we do. There is power in it. The servant of God calls upon every youth who loves the Lord to confess Him before his fellow youth. “Tell them how you found Jesus and how blessed you have been since you gained an experience in His service. Tell them what blessing comes to you as you sit at the feet of Jesus and learn precious lessons from His word. Tell them of the gladness and joy that there is in the Christian life. . . . This is genuine missionary work, and as it is done, many will awake as from a dream.”—Testimonies, vol. 9, p. 48. Yes, brethren, “many will awake as from a dream.” We have seen this happen time and time again. During the final service of testimony in one recent campaign, a well- known youth who had wandered far from Christ came to the microphone and gave a broken and heartfelt testimony of his decision to turn from a life of sin and follow Christ all the way. Previously he had held back largely because of his companions. Now an appeal was made to his buddies in the audience to join him, to finish with sin and disobedience and with him confess Christ as their Saviour. More than twenty lads were soon on the platform beside him, some of whom were sobbing and under deep conviction. The personal testimony and witness of one youth did a work in the hearts of others that all the sermons of the previous week had failed to do. Scores were awakened “as from a dream.” It was a Pen- tecostal season. Hours after the meeting closed, youth tarried in the church with anxious hearts, wanting to know how to find Christ and get right with Him. The work of preaching and of soul win- ning, especially among youth, is a science so deep and so vast that we cry out, “Who of us, O Lord, is sufficient for these things?” I have not written of anything or told of any methods that are new to our men. What must be new among us is to be found in our hearts. If we would be God’s instru- ments, the fire must be kindled anew there. It is the atmosphere of spirituality around the preacher, the warm throb of his heart, his yearning for the souls of his people, his deep understanding of the longings, of the failures, and of the needs of his flock that gives his words power and wings them home to the hearts of his hearers. Fortunate the congregations who get such ministers. Then, too, our great need is simplicity in presenting the love of God in Christ to our people. There is no substitute for this. “To invest the simplest truths with novelty and singularity, is to rob them of their power to win souls to Christ.”—Sons and Daugh- ters of God, p. 266. Let us shun the spectacular and the novel and hold to the simple, direct preaching of Christ and the Word. In music let us discard the superficial and the showy and hold to the grand old hymns and songs of the cross, of Zion, and of Christian experience. Many of the greatest hymns of the Christian church were born in times of mighty spiritual awakening when men’s souls were stirred to deep devotion to Christ. If we would see sinners brought to the foot of the cross and the saints established in holy living we must preach on the great themes of the Bible. J. H. Jowett once said, “Our visions always determine the quality of our tasks.” Too often the preacher’s vision is limited because he has not, like Isaiah, seen “the Lord sitting upon a throne, high and lifted up” (Isa. 6:1); consequently his sermons are inadequate for the desperate needs of his flock. Let the great themes of the love of God in Christ, repentance, forgiveness, justification, sanctification, a full salvation through Jesus Christ, and His glorious return be presented. No sentimental preaching of the gospel, no preaching merely of lofty idealism will bring healing and salvation to the people. We are warned against this type of preaching. “The Lord desired His servants today to preach the old gospel doctrine, sorrow for sin, repentance, and confession. We want old-fashioned sermons, old-fashioned customs, old- fashioned fathers and mothers in Israel. The sinner must be labored for, perseveringly, earnestly, wisely, until he shall see that he is a transgressor of God’s law, and shall exercise repentance toward God, and faith toward the Lord Jesus Christ.”— Selected Messages, vol. 2, p. 19. This precious Advent message was born in one of the greatest revivals in history. It will close in the mightiest revival of all time. Brethren, our task is a holy one. It is an imperative one. Thousands of our youth and of our people must be brought to realize that “a mere profession of Christ is not enough to prepare one to stand the test of the Judgment” (Ellen G. White in The Review and Herald, Jan. 25, 1887), and that “only those who are clothed in the garments of His righteousness will be able to endure the glory of His presence when He shall appear with ‘power and great glory.’ “— ELLEN G. WHITE in The Review and Her- ald, July 9, 1908. In the last message the servant of God sent to the General Conference, in 1913, she says, “I have been deeply impressed by scenes that have recently passed before me in the night season. There seemed to be a great movement—a work of revival—going forward in many places. Our people were moving into line, responding to God’s call.” —Testimonies to Ministers, p. 515. Could the scenes we are witnessing in places here and there on the earth today be a part of that greater movement, that work of revival and reformation which the servant of God foresaw forty-six years ago? This work is long overdue. The power of Pentecost is our supreme need. May we, His servants, not fail Him or His people in this last solemn hour. We have been impressed with the amount of early documentation of Fitch’s life and work. NINETEENTH MEETING GENERAL CONFERENCE COMMITTEE. Battle Creek, Mich.t Friday, 4 P.M., March 26. Jones, Holser, Evans, and Moon. take the Presidency of the Quebec and Ontario Conference. Battle Creek, Mich., 8 a.m., April 27, 1899. L A Hansen, W E Howell, C L Be neon, T E Bowen. to sail at an early date. W W Prescott, E R Palmer, F Griggs, W A Spicer; also T E Bowen. F W Paap, T E Bowen. Prayer by C S Longacre. WE are glad to announce that the work here is getting along nicely this summer. We picked nearly fifteen thousand boxes of strawberries, and up to the present nearly three thousand boxes of raspberries. Other crops are doing quite well. The prices of fruit are a little better than last year, so there is a prospect of the farm clearing a little money this year. Because I have been kept so close to the farm work this summer I have had little opportunity to look around for students, so I wish to ask that all who are expecting to enter school at the opening to send me their names at once so we may know how full the school is to be, and whether we will have room for all. We will be glad also to receive names of those who ought to be in school. We feel that we are very fortunate in securing help of Prof, and Mrs. L. A. Jacobs of Cedar Lake Michigan for the coming year. They have both had several years successful experience in our denominational schools, both church schools and academies, and will be of great help to us here. They will take charge of the home, and help in the teaching as needed. Miss Mabel Patterson will teach English and Music, while Brother Jacobs can teach Band and Orchestra instruments. Let all join in an effort to make this the best year Lornedale Academy has seen. THE following account of the dedication of the Oshawa, Ont., church appeared in the Evening Telegram of Toronto, April 8, and is printed here as a report of that event. Oshawa, April 8—A solemn and impressive dedication ceremony was held at the Seventh-day Adventist church only recently completed on Saturday when prominent elders of th« Seventh-day Adventist movement in Canada and the United States attended the service. The church, which stands on Albert street, was completed by members who gave their time and labor, and now the congregation is practically free from debt. Nathan Wagar was the minister in charge of the dedication service while those who took part included Elder M. N. Campbell, elder in charge of the church in Canada and Newfoundland, and Elder M. V. Campbell of Union Springs, New York. C. G. Maracle of Oshawa Missionary College, gave a history of the local church, while representatives included S. G. White of St. John’s Newfoundland; Elder H. A. Lukens of Toronto, in charge of the province of Ontario; P. D. Gerrard of Winnipeg, and E. A. Beavon of Vancouver. Elder Campbell outlined the reasons for the existence of the Seventh-day Adventist movement, and reviewed the basic doctrines on which it was founded. Chief among the doctrines, he said, was the belief in the nearness of the second coming of Christ and observance of the seventh day in the week as the Sabbath. “Work of the Seventh-day Adventists began in the year 1912, when Brother and Sister Nathan Wagar moved into Oshawa in January of that year,” Mr. C. G. Maracle said, in his historical review of the church. Soon after the Ontario Conference decided to locate their conference academy east of Oshawa. About the end of February the forerunners of the school came to the farm where the college and publishing house are now located, and started Sabbath services in the old stone house now used as the woodworking plant. The Oshawa church was organized in March, 1912, with seven charter members. Through four years of lay effort by Brother Nathan Wagar, the membership steadily increased. For a number of years meetings were held in the Sons of England Hall. The question of a church building had been talked of but did not take definite shape until four years ago, when a lot was secured and the basement of the church completed, in which meet ings were held during that time, the depression hindering the completion of the church. A temperance week featuring the many aspects of healthful living was conducted at O.M.C, February 1-7 by Kenneth Manuel temperance committee chairman; David Gay, assistant chairman; Janet Self, secretary; Linda Craig, treasurer and Mr. David Igler, speaker. Temperance topics were presented in five joint worship sessions in the evening, two chapel services, and the Friday evening vesper service. “Cancer by the Carton”, a motion picture dealing with the harmful effects of tobacco and “Out of the Night”, another picture presenting the fact that an alcoholic can reform only with God’s help were presented in two of the meetings. Highway patrolman P. C. “Casey” Hilliard spoke in another session of his observation that most highway accidents are in some way related to alcohol. 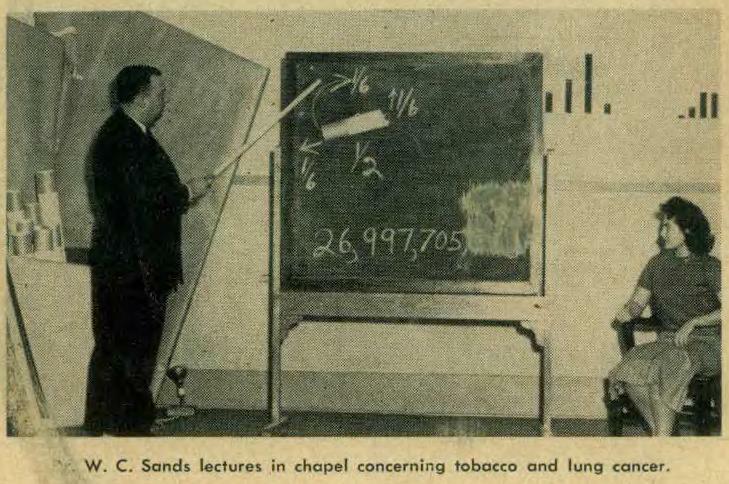 In one of the chapel services Dr. W. C. Sands discussed tobacco, cigarette filters and lung cancer. Other speakers were Rev. Smalley of the Ontario Temperance Federation and Elder Rudy Knauft. At each session except the Friday evening vespers Roy Malcolm gave a short punch in words, statistics, dialogue or demonstration form, against various kinds of intemperance. After the close of the special week the committee launched into other activities. They are planning to sponsor a temperance contest which will include speeches, essays, poster preparation and jingle writing. It is their hope to post some of the winning jingles on the highways near Oshawa. Also the committee is planning a Sabbath church service in the College Church to emphasize temperance February 28. 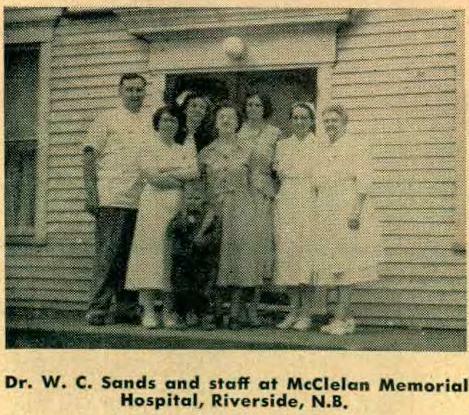 THE staff of our hospital (McClelan Memorial Hospital) at Riverside, New Brunswick played host to the community on National Hospital Day, May 12. A good response was shown as the local citizens visited the hospital for a tour. After the tour a programme was presented in the community hall. Mrs. Ruth Sands, supervisor of the nursing staff, gave the story of Florence Nightingale, whose birthday is May 12. Mrs. Haves, a staff nurse, depicted Flor-ence Nightingale. A coloured scenic movie, and a new cancer prevention film were shown as well as kodachrome slides of the Loma Linda division of the College of Medical Evangelists. The ladies of the local Women’s In stitute served refreshments at the close of the programme. The hospital tour and the programme were accepted very well by the community people present and we heard some very good reports later. They appreciate the service they receive while in the hospital and consider the care they receive while there the best they could possibly get. We sent in a write-up of tbe hospital-day ac tivities and a picture of the hospital to the Moncton Times-Tran script and they gave us very good space in their paper. The McClelan Memorial Hospital, often referred to as the Riverside Hospital is owned by the county, and supervised by a Board of Trustees made up of prom inent business men in the community. It was founded in 1919, and named after a former governor of New Brunswick who sponsored the original hospital. In the fall of 1947, Dr. and Mrs. Martin Hoehn came to Riverside and reopened the hospital and staffed it mainly with Seventh-day Adventist help. In July, 1952, Dr. Hoehn accepted a call to Jamaica, BWI, to be in charge of the Andrews Memorial Hospital and we came here to carry on the good work that he had started. He pays in all $13000, $1000 when the contract for the deed is signed, which has been paid me, and 1 now have it on deposit in the bank, $4000 when the deed passes, which cannot be done until ratified by the Conference, and the remaining $8000 to be secured by first mortgage on the land with interest until paid at the rate of five per cent semi-annually, and an agreement to keep the buildings insured for not less than $4000 at the expense of the purchaser, and in case of fire the proceeds to apply on the mortgage. We are at liberty to rent the buildings for another year at the rate of twenty-five dollars per month for the school year, and to have all this year’s crop. The difficulties encountered in making this sale and in endeavoring to make the title sure to the vendee could not be told in three papers the size of the MESSENGER. Elder Kirkendall and I were going from one lawyer to another and from one place to another for over a month, finding old papers, and in fruitless endeavors to satisfy the objections of the lawyers, until at last Elder Kirkendall told them they could take it as it was, or go without it, and call the deal off. No doubt all the readers of the MESSENGER and the Review in Ontario have noticed the call for the special meeting of the Conference for the purpose of selling the Lornedale Academy property. Perhaps some have wondered why this move on the part of the committee, therefore we believe a short explanation will be acceptable. When I came to the Conference a little over a year ago, almost the first thing of a discouraging nature presented to me was the situation of Lornedale Academy and its unsightly buildings, and I must confess that when I arrived upon the Academy grounds, and viewed the surroundings, I had the impression that those who made the remarks were in a degree justifiable. In the first place the building is not the best arrangement for a school, and it would take considerable to make it such. The out buildings are in bad shape, and it would take more to put them where they should be, and erect the other necessary buildings to accommodate the teachers. Part of the soil is excellent for one thing only, and that is fruit. The rest of it affords space and plenty of hard work with little results financially, while all of it must be heavily fertilized in order to bring favorable returns, and as a result we are compelled to buy grain for the stock instead of raising it on the farm, which to me seems a bad arrangement. After taking all these things into consideration, the Conference thought it best to offer the farm for sale, and if we could get all the money back that had already been spent on it, we would locate at some other place where land is cheaper, and where we could erect buildings more suitable for a school, and in this way overcome the present difficulties. In harmony with this idea we have been watching for an opportunity to sell, with the result that we have entered into an agreement to sell it for $13000 with no agent’s fees or commission to pay, and the privilege of holding school in the buildings this next term, and we hope by that time to have the new location ready so that there will be no break in the school whatever. We have no location yet, but as soon as the sale is completed, we expect to have a locating committee appointed, and then we hope that all the members of the Conference will appoint themselves as a committee to look for a nice location, and send the same to the locating committee for consideration, and especially so if anyone knows of a place, where buildings are erected suitable for such purposes, and can be purchased at a low figure. Last but not least we hope that all will remember us at the throne of grace that we may be directed of the Lord so that the school work in this Conference will prosper, and be the means in the hands of the Lord in educating the young people of this Conference for the Master’s service. In harmony with a resolution passed at the last session of the Ontario Conference the business of the Conference will be transacted upon the first three days following the camp-meeting. Therefore the eleventh annual session of the Ontario Conference of Seventh Day Aclventists will be held on the camp-ground at Hamilton, Ont., from Sept. I9th to 21st, 1910. The first meeting of the session will be called Monday Sept. 19, 1910 at 9 A. M.
At this session of the Conference, officers will be elected to serve for the following year; also other important matters relative to the welfare of the Conference will be considered. All persons in good and regular standing who hold their membership in any one of the Seventh Day Adventist Churches in Ontario and who may be in attendance at any one of the regular meetings of the session of the Conference are counted as delegates and are entitled to all the privileges of such. We therefore urge upon all their duty to be present and in the fear of the Lord bear the responsibility laid upon them as members of the Conference. AS the time draws near for our annual camp-meeting no doubt many of us wonder if we can find the time and means to attend. Let me say to such: you cannot afford to miss the blessings of the camp-meeting. In Rev. 7: 1-4 the holding back of the angels of the destruction of the world is presented to us and no doubt if our eyes could behold the conflict as it really is we would hasten our preparation. Surely since the angels are commissioned to hold back the destruction until the servants of the Lord are sealed there is nothing so important as the preparation for this work to be done for us. Our camp-meetings are designed by the Lord to be a means in instructing his people in the fear of the Lord that they may be hid in the day of his anger; therefore if it is any way possible for you to attend one and you do not you may suffer an irreparable loss. If the way seems, to be hedged up by the enemy, let me suggest that you had better seek the Lord earnestly to open the way. It may be possible that the enemy is working to defeat you and thus keep you from receiving the very blessing you at this time need in your preparation. Come brethren and sisters, feeling your need; come with meekness and humility; come with a spirit of repentance; come and let us seek the Lord together for his blessing and He will not disappoint us. May it be so. You are currently browsing the archives for the Canada category.